Just months on from purchasing a five acre plot at a regeneration site in Rotherham, Trebor Developments has secured detailed planning consent for a large industrial speculative development. The project, called Atomic 31, will deliver a single unit of 78,458 sq ft on the remaining land at the former Dinnington Colliery which is an easily accessible site, located less than 2.5 miles from Junction 31 of the M1. The former Dinnington Colliery site has been transformed. The remaining 44 acre site on Todwick Road, adjacent to the existing 45 acre Dinnington Business Park, already had outline planning consent. 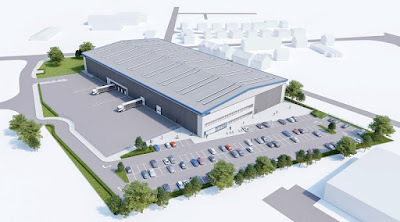 Local specialist developer, St Paul's Developments agreed in 2015 with the Homes and Communities Agency (now called Homes England) to create a 750,000 sq ft logistics hub and the site was granted Enterprise Zone status. New plans have also been submitted from another local specialist developer, E V Waddington Ltd, and included creating a speculative development on around 12 acres of land off Todwick Road. Trebor Developments's speculative development has the potential to be used for B8 use (storage and distribution) or B2 general industrial use. The planning approval comes with a number of conditions relating to things like noise and drainage. Bob Tattrie, managing partner of Trebor Developments, said: "We are delighted to receive detailed consent that allows us to now implement this great development. We will be on site in the spring to provide occupancy for Autumn 2019, offering much needed quality industrial accommodation on a lease basis." The acquisition of the five-acre site, for an undisclosed sum, was the second between the partners following the announcement in March 2018 at MIPIM that Trebor had entered into a long term strategic partnership with Hillwood to undertake industrial and logistics developments across the UK. Trebor Developments LLP was formed in 2008 by Tattrie, the former managing director of Alfred McAlpine Developments. Trebor/Hillwood are advised by agents at CBRE in Leeds, CPP in Sheffield and Knight Frank in Sheffield. It's good news but the increased volume of traffic, at peak times, on Todwick Road (to\from A57) may well become an issue re. further development.